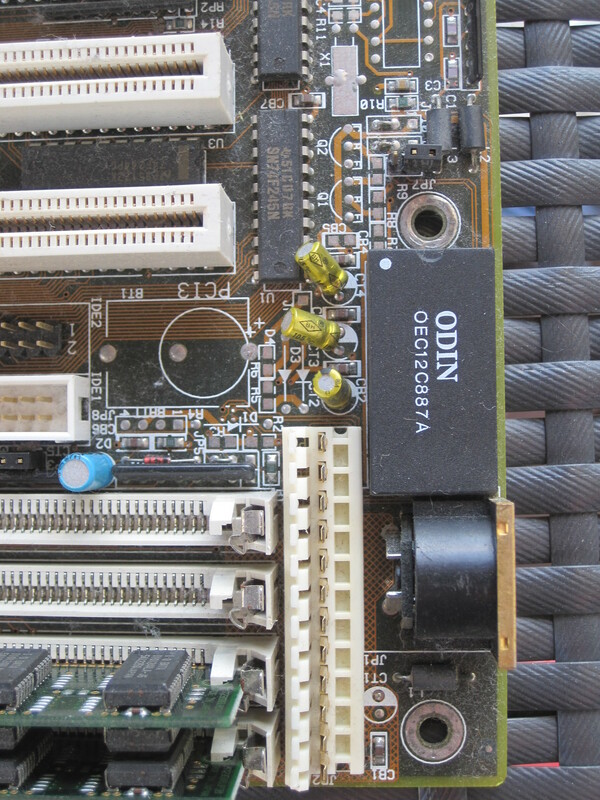 Today I’m looking at another 486 socket 3 motherboard that unfortunately I can’t identify. Unlike the last one, this one actually had it’s model number on the silk screen, but the OEM who put it into a machine has covered the silkscreen label with either white paint or white out so that it is unreadable. Obviously this is a massive pain as I have no chance of finding a manual for this board, which is needed because of the large number of jumpers. I suspect they didn’t want end users finding out that it was a low quality board. Here’s a photo. 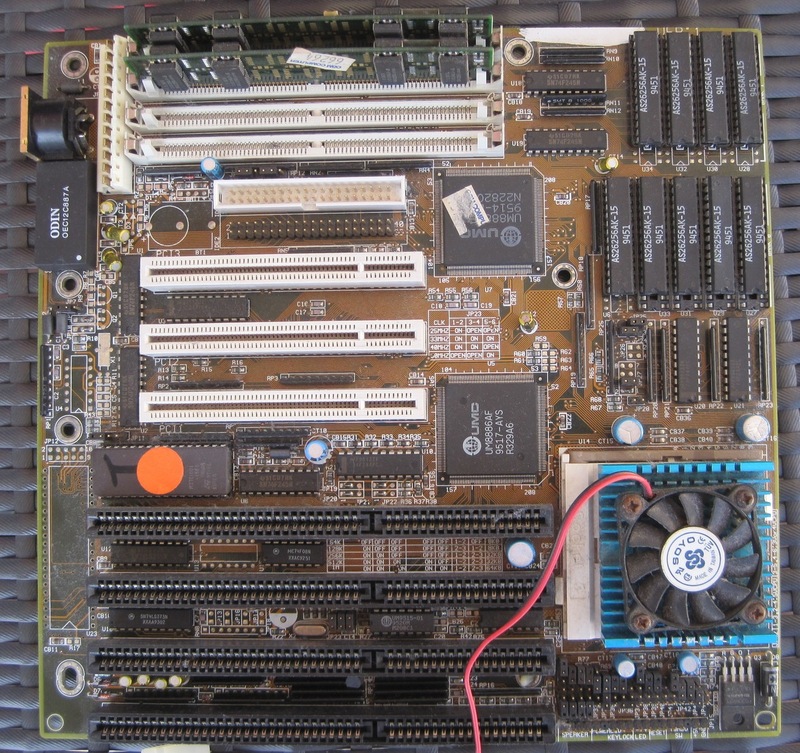 Again it’s a later 486 board as it has PCI slots rather than VLB slots. Reading the date codes on the chips reveals it was made in mid 1995, around the same time as the other socket 3 I have. The chipset was made by UMC, which I’m unfamiliar with. After having done some forum lurking over at VOGONS and reading some of the Red Hill Guide, it seems that it’s a fairly common chipset found on a variety of boards. I can’t comment on the performance myself, but others have had success getting decent performance out of their chipsets. There are very few integrated peripherals, it has an old school DIN keyboard connector and two IDE ports, but strangely no floppy disk controller, serial or parallel ports. This ultimately wouldn’t have saved much money for the end user as they’d have to use add in cards to replace the functionality. Weirdly the IDE ports each use different styles of socket, another sign of cheapness. 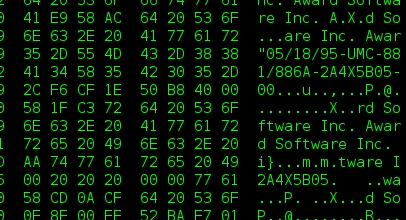 The cache chips and system ROM are all socketed, which is a good sign that the cache is probably not a fake. The EPROM unfortunately had the sticker missing, exposing the window for the UV erasable chip. I’ve since put my own sticker over the window to protect it. In an effort to identify it, I decided to pull the ROM chip and read it in my TL866 universal programmer. I was hoping to find a string that had the model name in it directly,but after an extensive search I only found the BIOS version string, “2A4X5B05”, which was enough to identify the manufacturer as Biostar but not the model. Another unfortunate feature of this board is this real time clock chip with integrated battery. The idea is great in theory, but results in an unusable board when the battery runs flat, which it has. Some of these RTC chips had the option of an external battery, unfortunately this isn’t one of them, so the only option I have is to either replace the chip (it’s not socketed) or hack it open and attach an external battery. Unfortunately this board doesn’t even remember the settings through a warm reboot, preventing it from actually booting an OS. Like many 486 boards much of the basic configuration is done with jumpers. This usually means looking them up in the manual, but this board does have the basic settings for voltage, FSB speed and L2 cache size. Still there are obviously many more jumpers that are undocumented on the board, so the manual would be really handy. Luckily the silk screen has enough information you could install a CPU and not make the magic smoke escape. At the time this board was made it was fairly low end, and windows 95 was just around he corner. It would have probably performed ok with MS-DOS and Windows 3.1, but would have been inadequate for Windows 95 when it came out later the same year. Most 486 machines didn’t really perform well with windows 95 so that’s hardly a surprise. The lack of integrated peripherals is probably the worst point with this particular board, as you’ll need add-on cards even for basics such as a floppy drive and serial port (which you’ll need for a mouse). Otherwise it would have made a serviceable, but not powerful machine.